There are so many reasons to be out on the water on a paddle board experiencing the unique perspective of standing on the water and being mobile. The stand up paddle board you choose depends on how you intend to use it out there. So many options! The great thing is that pretty much anyone can to it; from young children to seniors, complete beginners can have a great time, not just the elite athletes. You can go it alone, with friends, as a couple or as a family. 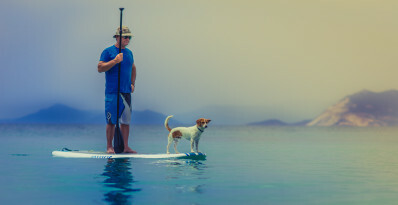 It can be just you and the board or you can choose boards that can accommodate supplies (like a cooler for instance) a friend, a family member or two or even your dog. Lots of dogs love to go supping! This is why stand up paddle board is the fastest growing sport in the world! It is an outstanding full body workout, and sup yoga is amazing. There’s the excitement of racing and surfing waves, the peace of paddle board yoga or fishing sup. If it’s the discovery side that interests you, then how about paddle excursions visiting different points of interests between Los Angeles and Orange County. That’s only naming some of the paddle board activities that you can have on the ocean. 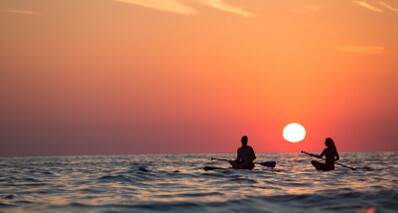 Do you see why we are so passionate about stand up paddle boarding? AND…we want to help you get the best board for your adventure! Are you looking for the best sup for surfing? How about the best sup hybrid or the best fishing sup, maybe you are just getting started and want to purchase one that you can improve on? That’s our specialty; helping you find the right one for you! No need to buy online or from some warehouse to get a deal! This combination is designed for beginners to buy PREMIUM BRAND and TOP QUALITY with FANTASTIC VALUE for season after season of STOKE! The Laird ST Cruiser is a perfect board for first time paddlers. It’s designed with a very stable platform for various sizes and levels of paddlers to use in all conditions from flat water cruising to surf. 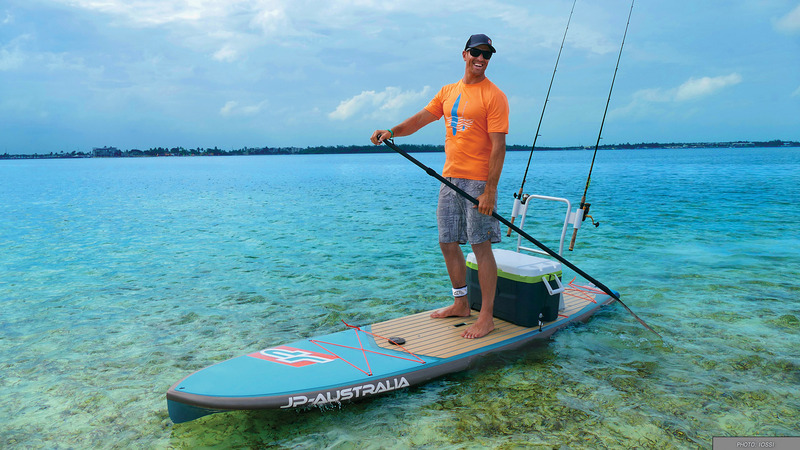 And the Kialoa Aloha II Adjustable paddle offers all of the features needed in a recreational all water paddle. You can confidently spend your time on the water knowing you have invested in a solid choice! One of our top selling categories because it gives the best of all worlds, and nobody else has these boards but us! They are designed for handling all conditions from flat water to open ocean. The great thing is that ANYBODY can paddle these and have a good time! Their differentiator designs are one-of a kind so they perform like no others. They are pretty much the next generation in design of stand up paddle boards. They are a hybrid between a V bow nose like a tour board built on an all around template and built so their nose has rocker (curve in the nose going upwards). If you are wanting to use your board in a variety of ways on the water, an all around paddleboard will be great to accommodate your needs.These SUP's paddle with comfort and stability from flat water paddling, to open ocean cruising, but they are not your typical all around shapes. Because they are designed from some of the top shapers in SUP, you get the top performance from a board that glides fast in flat water/ open ocean, and will also surf amazing too! We tested every model to ensure they provide the most stability in all conditions. The whole family can enjoy these boards too. They are very user friendly. If you’re looking to cruise distances and go exploring, these are your board. Touring Sup or Performance Paddle Boards are designed to be stable and easily paddled for distances. They are great for getting an amazing cardiovascular workout, building endurance and core muscle strength. Paddling these boards uses just about every muscle set in your body. Tour boards can also accommodate supplies and gear which makes them ideal for being out for the day stocked with beverages and food. These boards are generally thicker, wider, longer and have a pointed nose with a V shaped nose bottom for cruising and gliding the fastest, and tracking the straightest so you can get more strokes per side for the ultimate in efficiency in the water. Tell us what types of adventures you are looking for on your board and we can help you find the perfect match. What are some ideas for a great exploration? How about supping from Laguna Beach to Newport Beach or in the other direction down to Dana Point and San Clemente? First of all, surfing is fun for everyone not just for experienced surfers. We have boards for all experience levels and all price ranges. Even though we deal exclusively in premium sups, they come in all price ranges! And we believe that if you’re going to buy a board, we will provide the most options with the best bang for your buck. Surf paddle boards are uniquely shaped and designed for high performance so they can maneuver easily, carve and make quick turns and won’t nose dive dropping into the waves. The coolest thing is we have the most innovative surf shapes around that are basically surf boards you can stand on! In general, they are designed lighter, narrower and shorter. That being said, surf paddle board sizes and shapes range based on ability, size and weight of the supper and wave conditions. It is often a process to choose the right board that is best suited for you. Good news is that we help you get into the proper surf sup board and you can test ride on different boards before you purchase one. You can't get any more convenient than an inflatable paddle board, fits in a bag, store it in the trunk, take it on an airplane…..SUP DONE! Solves your stand up paddle board storage and transportation problems. And these are not your typical banana-boat isup's that paddle more like a raft which ride bouncy, bendable and unstable. These are the top construction, highest performance of inflatable paddle boards anywhere! They are designed with amazing rigidity substance so they are firm and stable, extremely responsive. So you can even carve a turn! No flex and bounce on these. Buy the real deal quality, for the real deal value! Changing the fishing game, one sup at a time! Paddleboard into your fishing spot like a stealth ninja, have all your gear on your fishing sup, and get the ultimate view down below! Ditch the 70 lbs kayak, and get on board with the fastest growing segment to hit the fishing sportsman world, SUP FISHING! The perfect fishing platform! Get out of the BOX and into nature! Experience yoga on an exponentially higher level. Take your yoga studio to the water! Paddle board yoga is a great work out. A much different experience on many levels than inside on a stationary surface. It’s fun, it’s challenging and it’s very peaceful. Our boards are designed to be stable, comfortable and light weight so they are easy and mobile. These boards are our demo models who’s time has come to get replaced by the newer model. If you don’t mind a used sup, the saweet thing is that we BABY our demo boards. So in most cases they just have some scuff marks or scratches, no biggie! Get in on a premium SUP, and get in on a PRIMO SUP DEAL! When it comes to sup paddles, it’s definitely not one size fits all! Our paddles all feature advanced design so that you will have a better easier time on the water. They are balanced and calibrated for smooth stroke and minimal fatigue. There are many options and variables. There are variations in materials, length, grip, shape of the shaft, as well as shape and design of blades. And it’s important to get the one you’re going to be the most comfortable with. And that’s where we can definitely help you find the right one for you and your paddle style. Yes, it’s all about the gear! In any sport you have the necessities and then there are the toys. And since we are a pro sup shop, we have both…..and we LOVE our toys!